Media captionJeremy Corbyn tells Theresa May: "When you cut local authority budgets by 40%, we all pay a price in public safety"
The government won the vote on the issue, the first of the new Parliament, by 323 votes to 309. 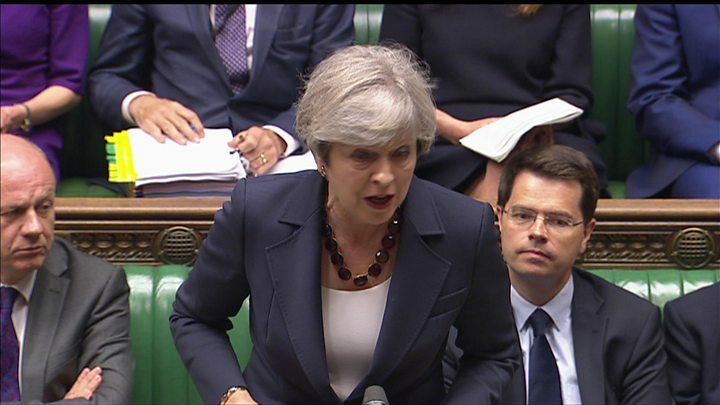 Labour's amendment to the Queen's Speech, which also called for an end to cuts to the police and emergency services, was defeated as the Conservatives and all 10 DUP MPs joined forces to oppose it - for the first time since the two parties announced a parliamentary pact. Pay rises for five million public sector workers are set by independent pay review bodies, but have effectively been capped at 1% since 2013, before which there was a two-year freeze on pay for all but the lowest-paid workers. The Conservatives went into the election pledging to maintain the cap until 2020, but some MPs are now calling for a rethink after the party lost its majority. Labour says its motion was a litmus test of MPs' willingness to oppose further austerity measures and the Conservatives had acted as if it was "business as usual". 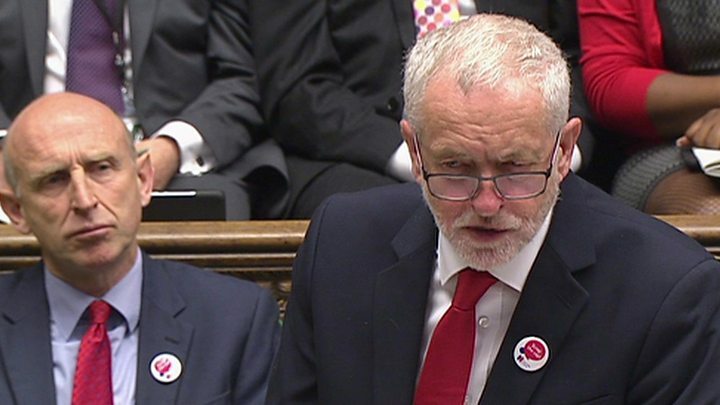 "Although government ministers said they had learned the lessons of the general election and were listening to voters, it is clear that nothing has changed," Jeremy Corbyn said. Before the vote, several Conservative MPs called for the cap to be lifted. Speaking during the debate, Conservative MP Andrew Murrison said public sector workers "give far more back to the service than we give to them in terms of the package", adding that he was worried the "well of goodwill" among medical workers would soon run "completely dry". Another Tory MP, former nurse Maria Caulfield, said medical workers "will vote with their feet" unless the pay freeze is tackled. Earlier, taking questions at an event in London, Defence Secretary Sir Michael Fallon said pay rates were "obviously something we have to consider not just for the army but right across the public sector as a whole". In line with Michael Fallon and Chris Grayling's comments, the government is ready to listen to the case to "scrap the cap" - bringing a potential end to the policy that was designed to save £5bn for the public purse by 2020. By teatime however, after the Treasury had slightly less enthusiastically said they were "open to discussion", that nurse, social worker, teacher or doctor had slightly less cause for feeling optimistic about a bigger pay rise any time soon. Number 10 had perhaps not changed, but certainly tweaked, their tune - saying when asked repeatedly that the policy has not changed, the independent pay review bodies will report in due course and the government will consider their proposals. So far, so confusing. Neither Number 10 nor the Treasury, who it's suggested were not entirely thrilled with the suggestion, are ready by the end of this political day to be able to make such a big change, or to give Labour such a big victory. The problem for them, however, is not just what appears to be a changing mood among some voters, but also very public hints by cabinet members that the cap, becoming painful for some as inflation starts to lift, could disappear along with Theresa May's majority. A Number 10 source said public sector pay restraint was "one of the tough decisions" the government had had to make but that ministers were going to "listen to the messages that were sent at the election" and said, "we understand that people are weary after years of hard work to re-build the economy". Health Secretary Jeremy Hunt reiterated this, telling MPs that ministers would wait for the recommendations of the pay review bodies before deciding what action to take. The suggestion of a change of policy was welcomed by campaigners, with TUC general secretary Frances O'Grady saying it would be a "massive victory for trade union campaigning". 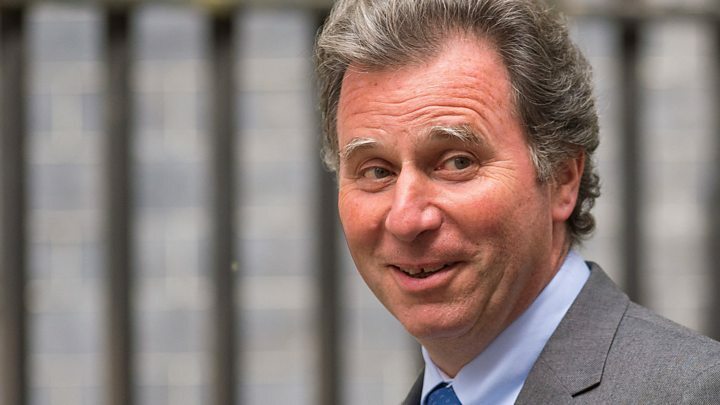 Speaking on BBC Radio 4's Today programme, former Conservative minister Sir Oliver Letwin said Labour were "playing politics" but "carefully judged" tax increases might be needed to raise money for public services. Media captionTheresa May warns councils they should be "doing the fire safety checks now"
"It may well be that, in one way or another, a large number of people will have to pay a little more tax if we are going to maintain the trend towards reduced deficits and yet spend a bit more on the crucial public services that do need more spending," he added. Meanwhile, the latest British Social Attitudes Survey has found an increase in the number of Britons who think the government should raise taxes and increase spending to its highest level since 2004. Earlier, during PMQs, Mr Corbyn linked the Grenfell Tower disaster to spending cuts. After Mrs May confirmed cladding from 120 high-rise buildings in 37 local authority areas in England had now failed fire safety tests, Mr Corbyn - to an angry reaction from some on the Conservative benches - said this was because cuts to local authority budgets had led to fewer building control and planning inspectors. "We all pay a price," he said, saying there were fewer firefighters in place and that the pay cap had affected recruitment. "What the Grenfell Tower tragedy has exposed is the disastrous effect of austerity. "This disregard for working-class communities, the terrible consequences of deregulation and cutting corners - I urge the prime minister to come up with the resources needed to test and remove cladding, retrofit sprinklers, properly fund the fire service and the police so that all our communities can feel safe in their own homes." Mrs May said the cladding of tower blocks had begun under Tony Blair's Labour government, saying this was an issue that had "developed over decades" under successive governments and different councils. Labour has claimed fire and rescue budgets were cut by 30% between 2010 and 2015, and a further 20% cuts are envisaged between 2015 and 2020. But Home Secretary Amber Rudd said the number of fire incidents had halved since 2010 and firefighters' rapid response to the Grenfell tragedy showed the strength of the service. DUP-Tory deal: Where is the money going to be spent?